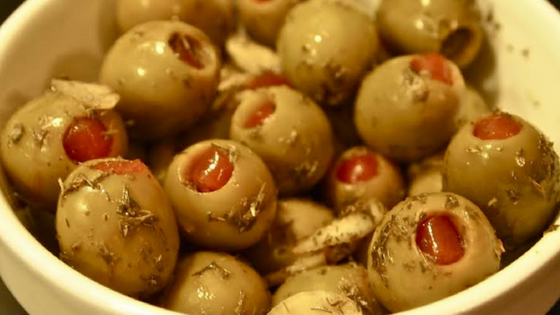 Smoked olives make a great appetizer! 3/4 tsp dried rosemary We have also used oregano with some great success but the rosemary has a better all around taste. Set pellet grill at 220 with perfect mix pellets. Arrange the olives in a shallow piece of heavy-duty foil molded into a small tray. Place the olives in the smoker and cook until the olives absorb half of the liquid and take on a light but identifiable smoke flavor, 30-50 minutes. Time depends on your grill!! Taste test after about 15-20 minutes. The olives can be served immediately with some asiago grated cheese over them or can sit for several hours to develop the flavor further. Refrigerate any leftovers. Be sure to save the leftover olive oil for bread dipping – mmmmmmgood! Purchase your pellets from your local dealer, on Amazon or from our site. If you want to be sure to always have your Cookinpellets on hand order your pellets in bulk for the best deal!